The capital region hosts many attractions throughout its diverse town and cities that surround Albany NY. Saratoga Springs sits just north of the pack and offers a rich and long history as a health resort and host to yearly racing meets that bring in celebrity guests at “the oldest race track in America". Beyond the Saratoga Race Course, which doesn’t kick off until the end of July, is a charming town filled with mom and pop shops, relaxing nature retreats and exquisite dining experiences. Saratoga Springs first claim to fame was its quality mineral baths and pools that offer health-enhancing minerals and incredible healing qualities. These baths are open to the public and are dispersed throughout one of the many beautiful parks that contribute to Saratoga’s relaxing atmosphere! Saratoga Springs fuses nature and metro life in perfect harmony to offer you the best of both worlds. What are your best options for Mother's Day? Whether you decide a stroll through a park, a picnic, spa experience, wine tasting (or mineral springs tasting for those who do not wish to partake in alcohol), or the more common brunch date is more ideal - here are a few ideas to host mom on her special day in Saratoga Springs for Mother's Day. Located on the corner of South Broadway and Lincoln Avenue this winery offers tastings of more than 20 different wines. Awarded the Governor's Cup and John Rose award for their wines that are produced on the shores of Cayuga Lake, on their family-owned winery, this establishment delivers an informative and fun tasting. Our team highly recommends their Sangria! Located at 184 South Broadway, Saratoga Springs. The first pizza establishment was opened in 1905 in New York’s Little Italy, a neighborhood in Lower Manhattan, NYC! What is a pizza, other than a conundrum of delicious bombs going off in your mouth? Pizza can be so so simple - dough, red sauce, topping. But for some, it is much deeper than that (literally can be if you choose a Chicago deep dish!) and many more fine-tuned flavors. We asked the Saratoga Springs commuters where they go for the best slice of pizza! Before you take off on a mission to discover your perfect slice, let's take a look at a few different types of pizzas according to Wikipedia! The Neapolitan Pizza is often considered "the original” pizza as it was brought to this country by Italian immigrants. The dough is made with a wheat flour and a special yeast that will yield a crunchy and thin crust. Due to the thin nature of this crust, toppings are often kept to a minimal to ensure it maintains its soft, elastic and tender properties. Typical toppings include tomato sauce (San Marzano to be precise), mozzarella cheese, and fragrant basil. 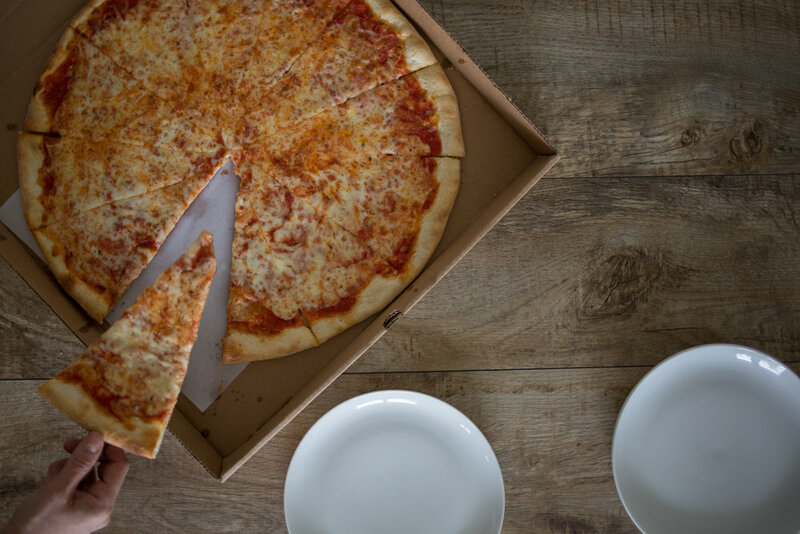 New York Style Pizza typically are large and wide slices that are made to be folded in half, which makes it easier to eat for people on the go as it collects the oil in the crease. Because it’s made to be folded, the toppings aren’t piled on like some pizzas. The crust is typically thin and crisp and made from a high-gluten flour. Sicilian Pizza is normally made in a large rectangular shape making it a great choice for gatherings. It’s popular to top a Sicilian pizza with a stronger cheese than one would normally see on a pizza. Alternately, some Sicilian pizzas are topped without the use of cheese. The crust is of a thicker nature. Chicago Deep Dish Pizza is thick with toppings and has a medium crust thickness. This pizza resembles more of a pie than a flatbread like other pizzas. The fun things about this pizza it is assembled “upside-down” , the cheese is usually placed on the bottom and the other toppings added on top of the cheese to prevent the cheese from burning due to the longer than normal cook time. The sauce is placed on the top layer with a dash of parmesan cheese. This is one pizza you might want to grab a knife and fork to eat. California Style Pizza is known for their exotic fine ingredients like goat cheese, duck sausage , broccoli, and BBQ chicken. Dessert pizzas are a variation of the California Style Pizza! These are the main five styles of Pizza, other types are considered to be a variation of one mentioned above. Where are the best pizza places near me? I Love New York Pizza (A Maria Barr Team favorite) has a plentiful menu of appetizers, salads, subs, sides, quesadillas, pasta, wraps, gyros, entrees, and paninis. They offer New York Style pizza and Deep Dish Style pizza. Specialty pizzas include the Stuffed pizza, Chicken Marsala, Eggplant Parm, and Baked Ziti Roman. You can choose from an array of unique toppings to complement the standard, such as anchovies, broccoli, eggplant, and fresh garlic. Their salads are out of this world fresh and their Greek Salad a favorite. They have a dessert menu as well! THEY DELIVER! They are located at 26 Congress St, Saratoga Springs, NY 12866. They can be reached by phone at 518-587-6666. They are located at 46 Marion Ave, Saratoga Springs, NY 12866. They can be reached by phone at 518-584-1900. Mama Mia’s a casual Italian restaurant located in a strip mall. Their menu is sure to please everyone with its traditional Italian appetizers; soups; salads; calzones; rolls; all types of chicken, veal, and eggplant entrées; pasta; baked pasta dishes; all sorts of side dishes; hero's (sub sandwiches); gluten-free options; and of course, pizzas! Specialty pizza’s include Sicilian, Flat Bread Pizzetta with Grilled Chicken & Asparagus Tips, Arugula, Speck & Shaved Parmigiana Pizza, Crostini Pizza, and of course Mama Giovannaos Eggplant Parmigiana Pizza! They offer a dessert menu and beer and wine as well.THEY DO NOT DELIVER! They are located at 185 Ballston Ave, Saratoga Springs, NY 12866. They can be reached by phone at 518-583-7783. Pizza 7 offers a variety of gourmet pizzas, burgers, sandwiches, subs, salads, appetizers and wings, gyros. Specialty pizzas include Gyro Pizza, Cristiano Pizza, Margarita Pizza and a Greek Pizza. They also offer a dessert menu including cheesecake, tiramisu, cannoli, and baklava. They open early and close late for those who like to experience the nightlife of Downtown Saratoga Springs. THEY DELIVER LATE NIGHT! They are located at 7 Caroline St, Saratoga Springs, NY 12866. They can be reached by phone at 518-580-2000. Marino’s Pizza is an underground cult favorite. They’re the cash only, giant round pizza cut into squares, best-kept secret of Saratoga! They offer toppings such as sausage, pepperoni, meatballs, mushrooms, onions, peppers, black olives, garlic, broccoli, tomatoes, bacon, ham. anchovies. They stick with what they know the customer wants, therefore, their menu doesn’t go into elaborate specialties - more of a create your own style--like Sausage and Mushrooms. Other menu items are their famous subs, rolls, chicken wings and tenders. They are located at 46 West Circular St, Saratoga Springs, NY 12866. They can be reached by phone at 518-584-3030. Do you have a favorite that we haven’t mentioned? Tell us about it in the comments below or message us.